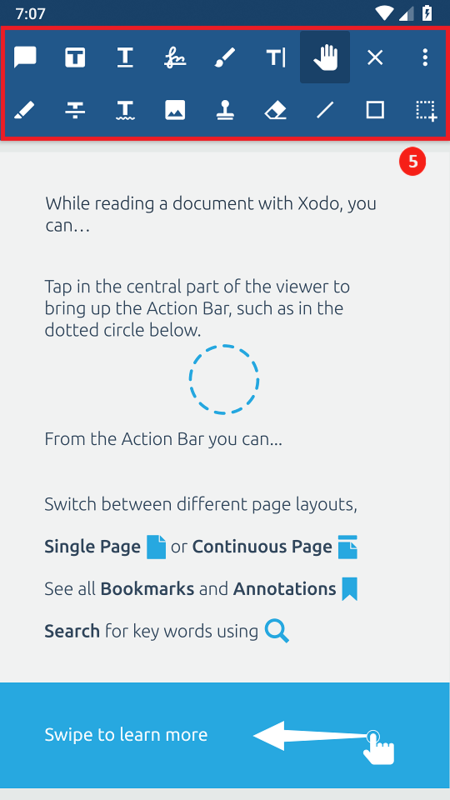 Here you'll find an overview of some toolbars, icons, and other elements of Xodo that you will be interacting with. 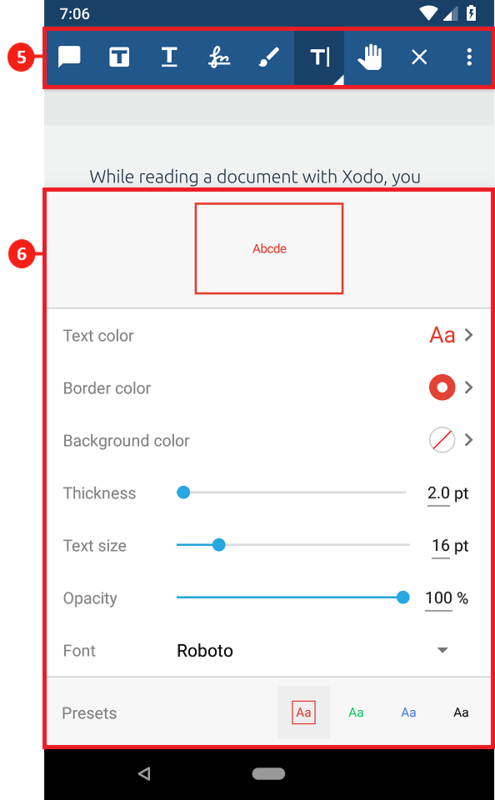 You can access these options by tapping in the center of the screen while viewing a document. 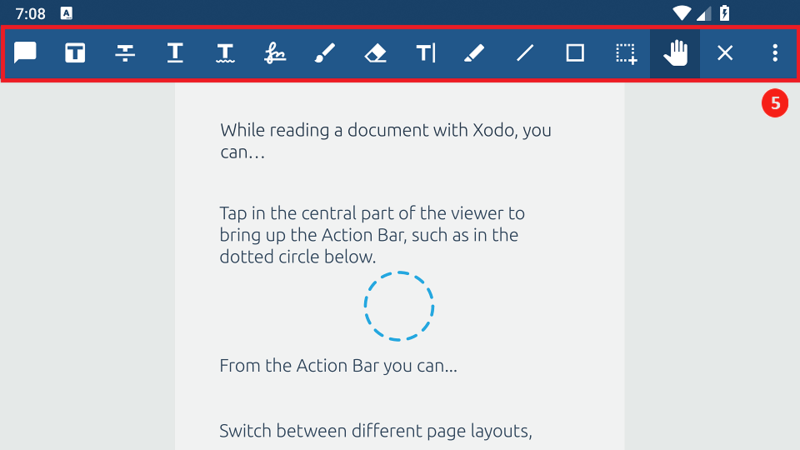 1 Action Bar Displays various options for what you can do with a document in Xodo. Search: Search for a word or phrase in the current document. View Mode: Change the view mode to display either a single page, two pages, reflow, or continuous viewing mode. Change the color to night mode, sepia and more. You can also access thumbnails view, and rotate and crop pages. 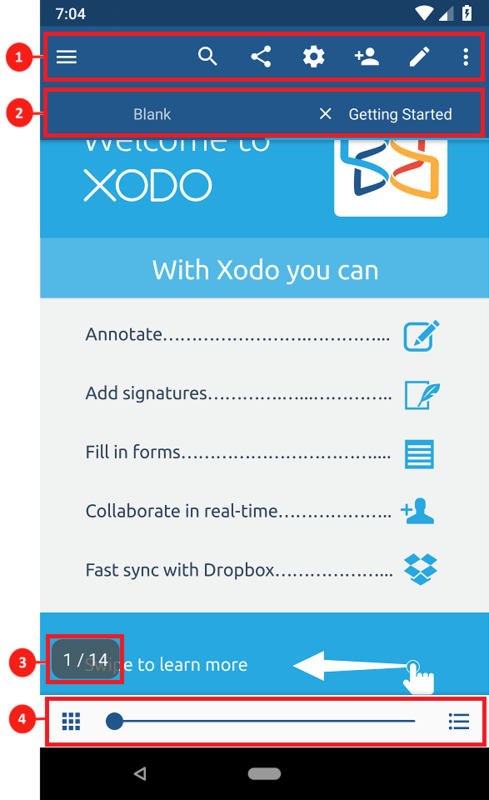 Xodo Connect: Invite collaborators to view and annotate this document with Xodo Connect. Annotation Toolbar: Access annotation tools, including text markup, signatures, and ink. Overflow: Access options to share, edit pages, print, or save a copy of the document. 2 Tab Displays the names of open documents. You can close a document by tapping the icon on its tab. 3 Page Number Display Displays the number of the page you are currently viewing and the total number of pages in the document. Tap on the number to jump to another page. 4 Thumbnail Slider Displays where you currently are in the document. The blue circle represents your position and the bar represents the length of the entire document. You can hold and drag the blue circle to move to another page. Bookmark: View and add bookmarks, view the document's outline, and view and edit a list of all annotations. Thumbnails: View pages in thumbnails grid. Add/duplicate/remove/re-arrange pages, change page rotation and export pages to a different file. 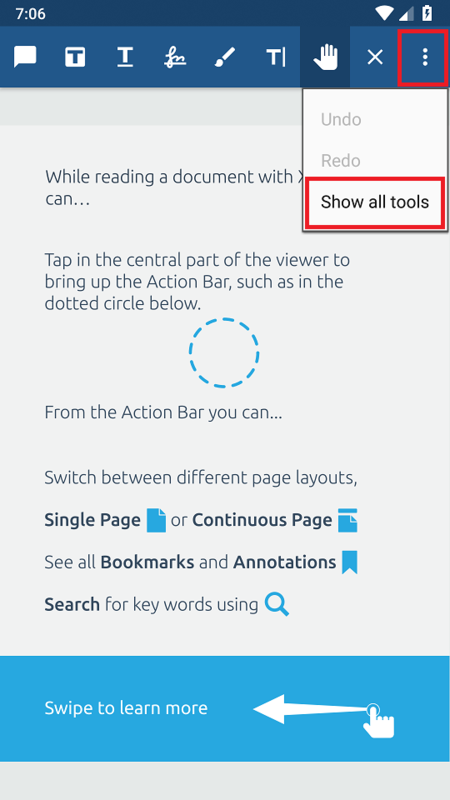 5 Annotation Toolbar Displays types of annotations you can make in a document. Comment Note: Add a comment to the document. Text Highlight: Highlight existing text. Text Strikeout: Strikeout existing text. Text Underline: Underline existing text. Link: Create link to the website or the page number of the document. Signature: Sign the document or insert your saved signature. Ink: Draw free hand on the document. Eraser: Erase free hand drawings. Text: Type on the document. Pan: Drag the document around while zoomed in. Exit: Close the Annotation Toolbar. Overflow: Access options to undo/redo. 6 Annotation Options Displays styling options for annotations. Available for all annotation types except for Comment Note, Signature and ink. You can access this window by tapping the annotation button on the Annotation Toolbar, then tapping it again. Color: Change the color and background color of the annotation by tapping the color you want. You can add or delete color swatches by using the + and - buttons. Size/Thickness and Opacity: Use the top row to change your annotation size (for Text) or thickness (for Text Strikeout, Text Underline, and Ink). Use the bottom row to change your annotation opacity. Basic/Advanced: Use to change between basic and advanced options. Advanced options offer more options for color, size/thickness, and opacity. You can manage your files and folders while on the Browse Folders tab or the Browse All PDFs tab. Search: Search for specific files or folders. View List: View files and folders in grid view, with thumbnail previews. Sort: Sort files and folders by name or by date modified. Filter: Filter which types of files are listed. 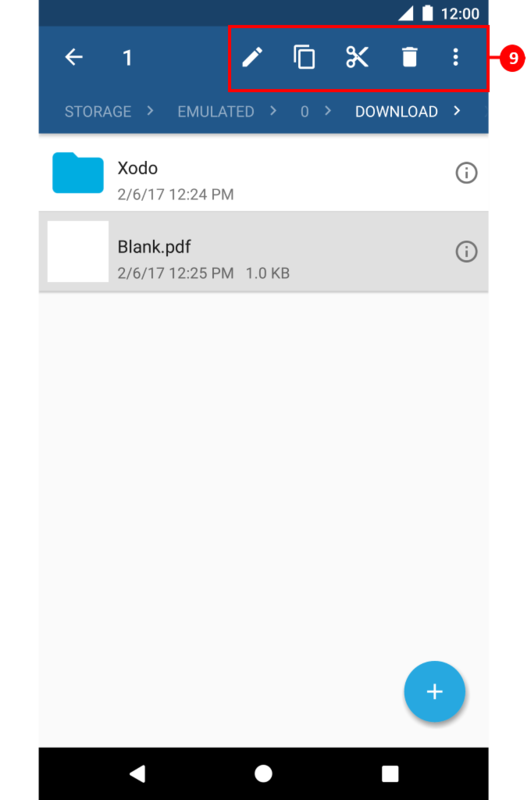 Blank PDF: Create a new blank PDF. PDF from Image: Create a new PDF from an image already on your device, or by taking a new photo. 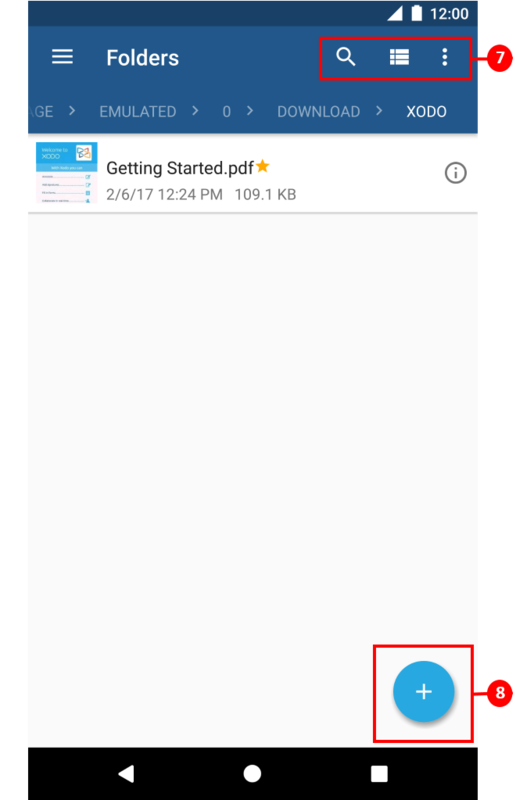 PDF from Document: Create a new PDF from a document (PDF or non-PDF) stored on your device. You can access these options by long pressing on a file while on the Folders tab or the All Documents tab. You can also access these options by tapping the Info icon for the file. Rename: Change the name of the document. Duplicate: Create a copy of the document. Move: Move the document to another location on your device. Delete: Delete the document from your device. Add to Favorites: add the document or folder to the favorite list. Share: Share the document through email, social media, or another app on your device.